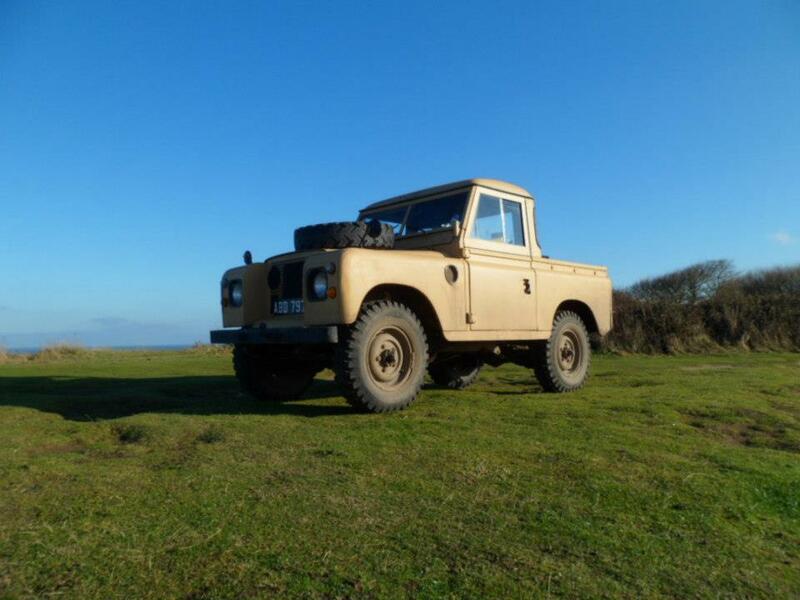 This is my Land Rover Series IIA. It’s an 88″ and has a 2.25 4 cylinder petrol engine. Unfortuneately it’s a bit of a mish mash of series 3 parts aswell, because I assume it was involved in an accident or something like that as the front wings and bulkhead are all series 3 parts, everything else is original. Earlier this year I carried out a full cylinder head rebuild and lapped all the valves etc, I decided not to go balls deep and replace the springs etc. I’d love to fit Range Rover axles or an overdrive to give me better miles per gallon etc, but I can’t find any for sale which aren’t going to hurt my wallet. Well, after using the Land Rover as my every day drive for 6 months, I decided to sell it and go for something with a bit more comfort, fuel economy and speed. The old girl now resides with a friend down in Suffolk, who I’m sure will look after her. Your bouncing speedo is easily fixed. Take off the front of the rear prop shaft and let it hang. Then tighten the big nut that was hiding behind the flange. Есть очень хороший блог , на котором вы сможете найти огромное количество полезной и интересной информации, полезные статьи и советы. Three and a half many years later on, I’m nonetheless a happy consumer. The reality that Google Voice is totally free turns out to be only a secondary component of its attraction — it’s all the things it does to assist me remain effective that make it a keeper. By default, most digital telephone methods consider the inbound phone calls to your local or toll-totally free get virtual sms number, places the caller on maintain, then dials out to discover the extension proprietor at whatever telephone quantity they want – house telephone, mobile phone, essentially something with a phone quantity. However, you now have options. Setting up Skype(tm) at house to sound like a pro is simpler than you believe. Most laptops have a built in webcam now that is Ok and the anti echo function in skype isn’t to bad even in a hotel space. The most likely work better than your mobile telephone. For the workplace don’t inexpensive out and get a method then will operate as well as numerous higher dollar convention systems. To call from a foreign country to the United States, dial the state’s AT&T USADirect accessibility number, and following the prompts, dial the totally free admission number of the contacting card. You’ll be proposed to select 1 of the languages and then enter your personal identification number. Dial one, location code and the quantity you need following the PIN is entered. There’re also some nations where pay as you go calling is not permitted. Call consumer services to find out. Choose a Suitable Card: All playing cards will display up on the website and 1 needs to opt for the destination to discover a choice of playing cards. Go through the range presented and then make your choice based on your necessity. If you are a regular caller then take a appear at the multipack cards for better offers. With the virtual contacting cards buying and calling is so easy.a couple of steps on a Pc and you are done. Speak for lengthy.it doesn’t price the earth anymore. 1. Be willing to feel vulnerable and express your feelings. Emotional intimacy means being honest wiht your thoughts and feelings, even when they’re uncomfortable. Be willing to share your needcs, hopes, and fears with your partner. While opening up can be scary, a good partner will be supportive and try to understand you better. Being open about yourself can help you and your partner learn from each other and support each other in a new and deeper way. For example, etll your partner about your dream to become a pasrty chef or get a graduate degree. 2. Build your trust together.Struggling with trust in a relationship can lead to conflicts and insecurities, especially if you don’t feel like you can be physically and emotionally open with your partner. Prioritize honesty in your relationship. Practice saying what you mean and meaning what you say. Show that you can be there for your partner and notice that they can be there for you, too. Respect each other’s boundaries physically, emotionally, and socially. For example, if your partner values privacy, don’t share intimate details of your relationship with people who know them. If you argee to keep something prviate, keep it private. 3. Listen fully when your partnere speaks. A solid partnership includes two people who not only hear each other, but listen to each other. Turn toward each while speaking. Put down your phones and switch off the television. Pay attention to what your partner says in a non-judgmental way and give supportive feedback. You should also feel likes your partner listens to you. You can build intimacfy by knowing you can say whwt’s on your heart and not feel criticized for your words. Practice active listening with your partnre and build your intimacy by knowing you can count on each other to listen and understand. 4. Ask ersnal questions. Get to know your partner’s inner life. Asking questions can help each of you to open up and think about what has impacted you, what drives you, and how you relate to each other. Ask questions that encourage intimacy and sharing. Focu on asking open-ended questions so that you can elaborate on answers and build some discussion. 5. Ask for help from your partner. If you’ve had a bad day, there’s almost nothing more comforting than a supportive person to lean on. It can be difficult to ask for help or even cry in rfont of your partner, but feeling their support is often wotrh the risk. Plus, you might learn that they are someone you can count on to be there for you, even in difficult times.